The comparison John Reilly makes here[via Robert Kaplan] between Iraq and India is a particularly interesting one. You do not usually hear of the two countries compared in any meaningful way, but the distinction here is the differing responses of each people to extended foreign occupation. Violent uprisings were seen in both places. Eventually, the British left India, but they stayed far longer, and left a deeper impression on the people of India. American commanders said 38 American servicemembers had been killed and 275 wounded in the Falluja assault, and the commanders estimated that 1,200 to 1,600 insurgents - about half the number thought to have been entrenched in Falluja - had been killed. But there was little evidence of dead insurgents in the streets and warrens where some of the most intense combat took place. It's straight war reporting. The journalists report from a US perspective, but they do not simply rewrite military news bulletins. The gist of the report is that Falluja was a difficult operation, tactically successful, and part of a coherent strategy that can succeed. Imagine now that John Kerry had won the recent election. It is unlikely that the headline would have mentioned "routing the enemy." Instead, the piece would have focused on the open-ended nature of the mop-up operation, and on the outbreaks of violence in other Iraqi cities. Indeed, there would probably have been more of the latter to report. Jihadis watch international television, too. They would have assessed the outcome of the election, not unreasonably, as a repudiation of the whole of George Bush's policies. Just as important, the officials of the nascent Iraqi government would have reassessed their own situation. Instead of desertions among the new Iraqi army and security units, we might have seen the legitimate administrations of cities and provinces going over to the insurgents. There have been some comparisons of the Falluja campaign to the Tet Offensive during the Vietnam War, but it is the differences that are important. Starting on January 31 of 1968, the North Vietnamese and Vietcong launched attacks intended to spark a general uprising in South Vietnam. The campaign failed completely. The Vietcong never recovered. Nonetheless, the offensive visibly persuaded the US media that the war was unwinnable, and that became the subtext of all subsequent reporting of the war. Actually, the change of heart in the media might not have had all that much effect on the North Vietnamese: they simply did not follow the US media that closely. However, they could scarcely have missed the implication of President Lyndon Johnson's announcement on March 31 that he would not seek a second term. Negotiations started soon thereafter. Negotiations, usually, are a good idea. Starting to talk then, however, demoralized the US military and demoralized the South Vietnamese. The talks did, however, cause the enemy to surmise that, whatever they were doing, they should keep it up. So they did. This was, pretty much, the pattern that John Kerry promised to repeat if he were elected. Falluja was the anti-Tet. If 3.5-million Americans had voted otherwise, it would have been Tet II. 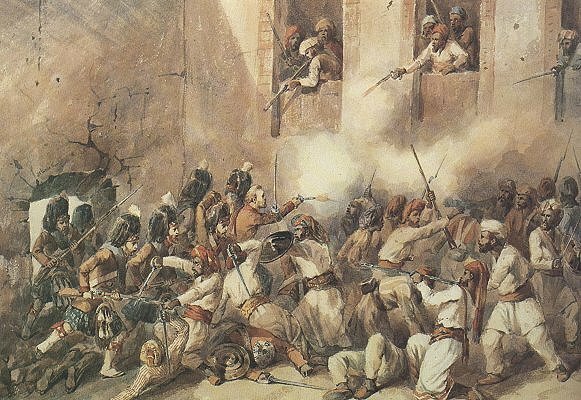 But rather than a replay of the Balkans in 1995 and 1999, Iraq has turned out like the Indian mutiny against the British in 1857 and 1858, when the attempts of Evangelical and Utilitarian reformers in London to modernize and Christianize India - to make it more like England - were met with a violent revolt against imperial rule. Delhi, Lucknow and other cities were besieged and captured, before being retaken by colonial forces. The bloody debacle did not signal the end of the British Empire, which expanded for another century. But it did signal a transition: away from an ad hoc imperium fired by an intemperate lust to impose domestic values abroad, and toward a calmer, more pragmatic empire built on international trade and technology. May I point out that this account has the history of the British Raj upside-down and backwards? When the East India Company had direct responsibility for the subcontinent, it did tolerate missionaries, but then it also tolerated most things. That was part of the problem. The British Empire in India only hit its stride after the Mutiny, when London assumed direct control, and attempted systematically to foster good government and a liberal civil-society. Speaking of Alternative History, readers may wonder why I have failed to do a review of Philip Roth's new novel, The Plot Against America. The fact is that I ordered the book through Amazon, but not from Amazon. Rather, overcome by parsimony, I ordered it from a third-party seller, for less than half list-price. The seller took the money, but if he ever had a copy of the book, he did not send it to me. Amazon, which collects the payments for these sellers, was nice enough about it. They promise me a refund, in the fullness of time. Nonetheless, hereafter I will regard all third-party booksellers with due caution. I have actually been sick for the past few days (kidney stones: ouch! ), and in my delirium, I viewed a VHS copy of Monster Island. This is an MTV Original Movie, though I think it might easily have been produced by the Disney people. The humor in the film is not always unintentional. However, I was chiefly struck by the film's geographical transpositions. A tropical island that had been a nuclear test site is located in the middle of the Atlantic (or possibly the Bermuda Triangle is supposed to be in the South Pacific, which would be awkward, considering the location of Bermuda). The wonderful thing was that this tropical island was covered with maples and beeches and freshwater lakes, such as one sees in Canada, where filming on location is cheap. ROCHESTER, NH -- Lawyers for a Farmington woman and her boyfriend who are charged with threatening to kill her three children in a church say their clients meant the children no harm. Nicole Mancini, 29, and John Thurber, 35, of Rochester, were arrested at St. Mary's Church on Wednesday after workers said they heard the woman say she wanted to sacrifice her sons on the altar. Each was arraigned on three misdemeanor counts of child endangerment on Friday. "They were never tied to the altar, there was no blood, there were no constraints for sacrificial use," said Kimberly Shoen, Mancini's attorney. According to Linda Slamon, Thurber's attorney, Thurber said Mancini had been acting "irrationally" recently, and Thurber accompanied her to church to get her help. One suspects the authorities overreacted.